Sometimes it takes a while to really hear an idea. Justin Turner told me something two and a half years ago that only recently clicked. All it took for this idiot to finally understand was an illustration of a bat path, a couple of graphs, and like 10 others players articulating a similar thought. Maybe you got it the first time. The rest of you, though, might benefit (as I did) from hearing it again: go get the ball. It’s that simple, but it’s also not that simple. The first time I heard it, I’d just asked Turner to identify the adjustment that changed his career. Non-tendered by the Mets following the 2013 season, Turner has been the fifth-best third baseman overall (and second-best with the bat) since 2014. He has credited Marlon Byrd with teaching him the key to hitting. Maybe I just didn’t have the tools to understand it at the time. What I thought Turner meant was to be aggressive and to employ more of a pull-power philosophy. In the post I wrote, I vaguely emphasized the importance of “aggression” and noted the bigger leg kicks that both he and Byrd had adopted. I didn’t notice that Turner’s pull percentage remained unchanged, though, or that his swing rate had actually declined. Maybe I ignored those facts. This time, I asked: is that about pulling the ball? “It’s not necessarily pull, it’s more don’t be afraid to get the head out,” thought Duffy. Transcribing that passage, I heard a deeply expressive “Yeah” from my side of the table. That might have been when some gears kicked into place. 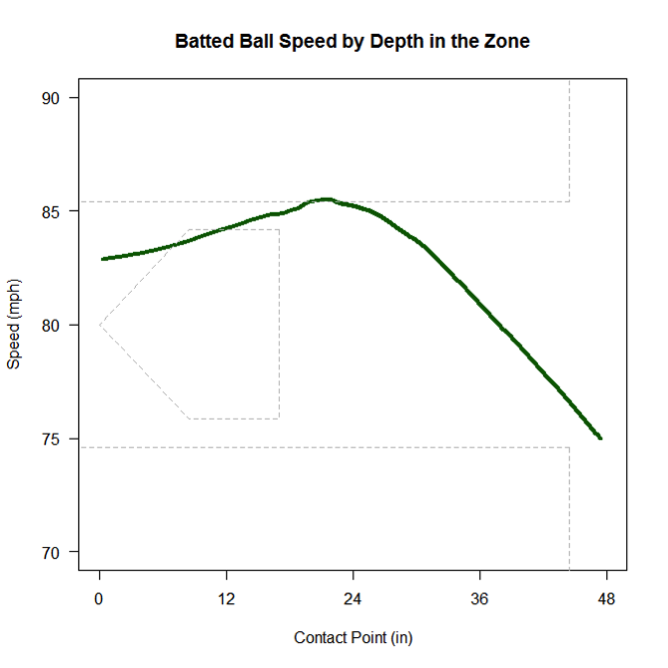 Later that spring, I mapped my swing against Hunter Pence’s with the help of Zepp’s awesome bat tools. You can really see what Haines was talking about. Watch the inevitable down/flat/up cycle of two very different batters, and you’ll notice they have a commonality: they have to come up at some point, and so there must be an optimal point of contact along that dimension for every hitter. If you want to lift the ball, it’s probably near the flat-to-upwards end of the swing. 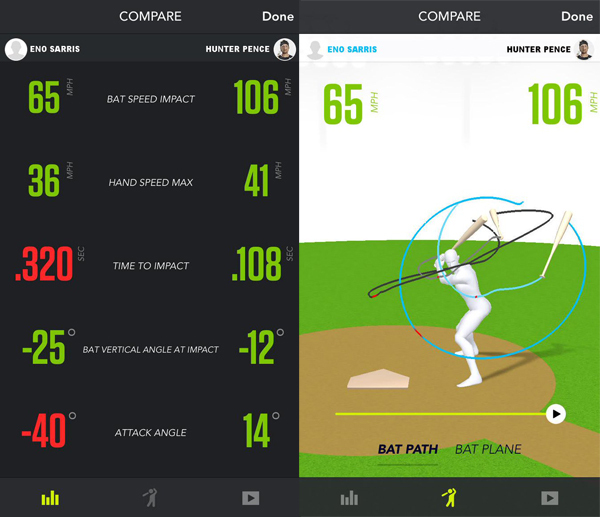 In the graphic on the right, look at that red point in both swings. That’s contact. See how Pence makes contact on the upswing? And how the man with zero baseball skills makes contact on the down part of his swing? Well, guess who’s hitting a ground ball and who’s lifting the ball. After all this, I was close to understanding. But it still took three conversations with players in the past week — for good measure, at least — to finally jar something loose. Giants outfielder Austin Slater was talking to me about moving past the Stanford Swing — which emphasizes getting the foot down early and hitting low line drives to the opposite field — and lauding the advice he got from the same Giants hitting coaches. Said Slater: “I’m trying to make an adjustment to hit for more power by going to get the ball out in front of the plate.” Currently, he pulls the ball about half as much as league average, but the power might be coming. Chad Pinder, Athletics outfielder, said he’s “making sure the contact is out front and not around the ball,” and that he’s not surprised that the use of this swing thought has produced more fly balls recently. Why yes, I have. That question, plus a conversation at Saber Seminar, prompted a call out to former Sportvision analyst Graham Goldbeck. He provided the visual evidence in support of what these hitters and hitting coaches have all been saying. Take a look at where homers live with respect to the plate. Note that this visual is based on HITf/x data, so the numbers are a bit different than you’re used to for the Statcast era, but the peak is clearly closer to the plate for exit velocity than for home runs. But that makes sense! We already knew that peak exit velocity and peak home-run angles aren’t the same thing. Hitters, as a group, peak around 10 degrees in terms of exit velocity, while 20-30 degrees produce more home runs, even at lower exit velocities. But at least this establishes a relationship between exit velocity and launch angle in the dimension that runs from the batter to the pitcher. Three inches is where exit velo peaks, and nine inches is where launch angle peaks. You could, if you had the right tools, math that relationship out. At the very least, it gives us a better understanding of how angle and velocity are related. When Trevor Story’s launch angle goes up and his exit velocity goes down, we know that these two things are related to each other directly by way of his point of contact. While it’s tempting to think of the hitter as manipulating his vertical launch angle, what he’s really doing is manipulating how far out in front he’s getting the ball. It also gives us a better language with which to express the actual work of changing launch angle and exit velocities to best fit each player. A hitter with less exit velocity to spare may actually want to think about letting the ball travel a bit — that’ll help him cover more pitch velocities and spray the ball around, and hopefully he’ll still be in that three to four-inch spot out in front of the plate. Hitters with power? Go get the ball out in front. 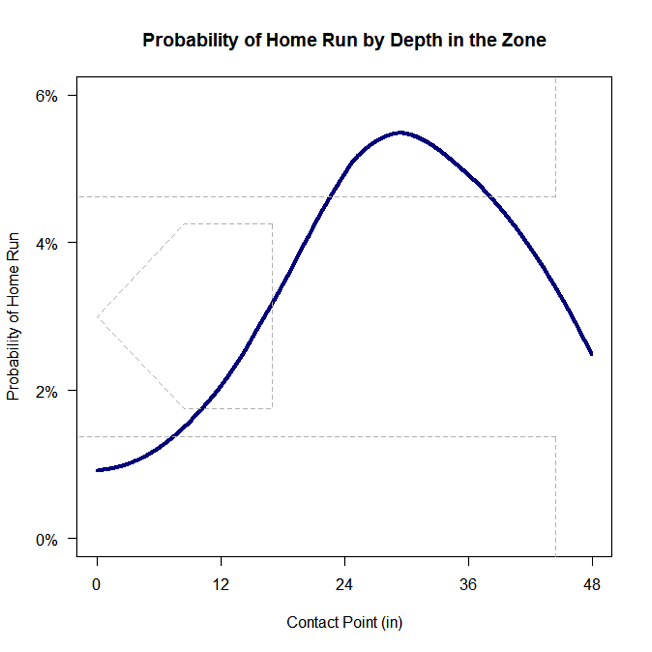 We hoped you liked reading Power Hitters Should Make Contact Out in Front by Eno Sarris! Interesting, and not necessarily out of line with conventional hitting philosophy; it’s just a lot more visual and specific, and a lot easier to communicate correctly.